Tax Day. What’s the Average Refund in the District? Taxpayers throughout the nation will be rushing to file their taxes today. In the past April 15th meant long lines at the post office; however, with today’s technology and tax filing software such as Turbo Tax filers can file their taxes from the comfort of their homes. The good news is that many filers will receive refunds at both the federal and local levels. According to taxpayer data from tax year 2012, there were 192,997 taxpayers that received both a federal and District refund. 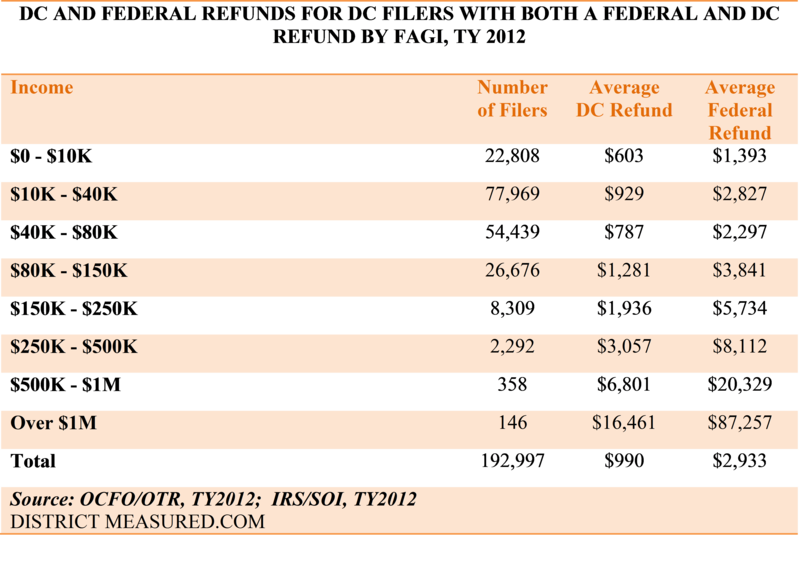 The average refund from the District was $990 compared to the average federal refund of $2,933. The table below provides a more detailed description of the refunds by income category. Even though they were the smallest group, those in the highest income category of over $1 million received the highest average refunds at both the local and federal level. Their combined average refund was over $100,000. See related post for Profile of high-income earners. The data used was from the District’s individual income tax database and the Internal Revenue Service’s (IRS) tax data for DC for tax year 2012. Last week D.C. Public Schools and the D.C. Public Charter School Board released waitlist numbers for the city’s public schools. The waitlists are a result of the first round of the annual public school lottery, which determines who gets seats at the city’s charter schools, at out-of-boundary traditional schools, and in the pre-K grades at traditional schools. We took a look at the waitlist numbers to see what they say about demand for public schools throughout the city. The waitlists aren’t perfect measures of demand – the biggest complicating factor is that all open charter seats are filled through the lottery, whereas open seats in traditional schools are offered first to students who live in the attendance zone, then to out-of-boundary students through the lottery. Still, we think the numbers paint an interesting story. Demand for DCPS schools is strong west of Rock Creek Park and in Capitol Hill. 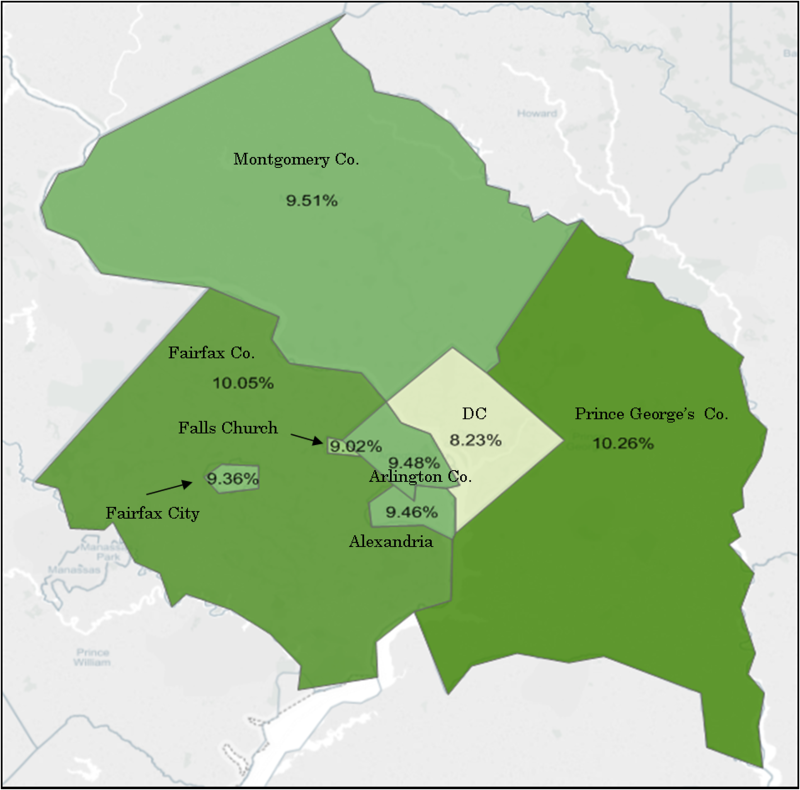 Charters are popular east of the Anacostia River and in the north-central part of the city. The charter schools with the longest waitlists are Two Rivers and Mundo Verde. In DCPS, Oyster-Adams and Brent Elementary have the longest waitlists. Demand varies by grade. Schools with similar test scores can have very different waitlist numbers. The graph below shows that a lot of schools with higher test scores also have high wait list numbers, but there are plenty of exceptions. Some of the waitlist differences are due to some apples-to-oranges comparisons we’re making, since we’re looking at both charters and DCPS schools; mixing early childhood, elementary, middle, and high; and have even thrown in application high schools. What exactly is this data? The waitlist numbers are from D.C. Public Schools (available here) and the D.C. Public Charter School Board (available here). Test score data and geographic data for schools (ward, latitude, and longitude) are from the Friends of Choice in Urban Schools (available here). The reading scores used in the last graph are the scores from the 2014 DC CAS. Note that the number of applications schools received are even larger than the waitlist numbers since students matched with one of their higher-ranked schools are removed from the waitlists of schools they ranked lower. Correction: In the original version of this post we were missing the waitlist numbers for the Spanish immersion program at Tyler, grades 2-5, and for the dual language programs, grades PK3-1, at the following schools: Cleveland ES, Marie Reed ES, Oyster-Adams, and Powell. This led us to undercount the waitlists at these schools in our original post. We’ve updated the post, map, and graphs to correct for this. How Green is the District? Part 1: When it comes to transportation, it seems very green. Bob Zuraski contributed to this post. An article in today’s Washington Post, “Metro’s new rail cars are ready for riders on Tuesday” prompted us to look into the commuting patterns of D.C. residents. To do this we analyzed data from the U.S. Census. As usual, we compared the District to other parts of the nation. Additionally, we highlighted commuting methods that are friendly to the environment and contribute to lower carbon emissions. These include public transportation, bicycling and walking. D.C. ranked second highest among these cities in terms of public transportation use with 38 percent of residents commuting by public transit, exceeded only by New York City. D.C. also had the second highest percent of commuters who walked to work at 12 percent compared to 15 percent for Boston. Portland took top prize among these cities for the percent of residents who biked to work, followed by Seattle and D.C. Even though cities like Portland and Seattle are often recognized as leaders for green initiatives, when it comes to transportation residents there still rely on cars. D.C. and New York are still leaders when it comes to green transit. Stay tuned for Part 2 of How Green is the District ? Note: I disagree with the findings of an earlier Economist/Siemens Report “US and Canada Green City Index: Assessing the environmental performance of 27 major US and Canadian cities” which ranked D.C. only 13th for transportation. The study stated “the city’s public transport network is shorter than average, at 0.4 miles per square mile, compared with the average of 1.1 miles.” It is not clear that this measure of public transit coverage factors in where people actually live (does the study’s calculation of public transit per square mile include park areas where residents don’t live? ) nor does this measure distinguish among means of public transit, faster subways compared to slower buses. At the end of the day, rather than focusing on hypothetical measures of availability, the statistics should reflect how residents actually commute. The data is from the U.S. Census Bureau American Community Survey. 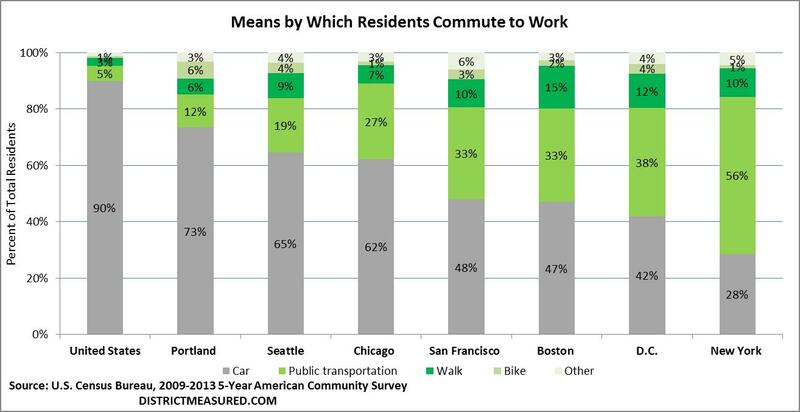 A great report on alternative commuting patterns that focuses on walking and cycling is Modes Less Traveled—Bicycling and Walking to Work in the United States: 2008–2012 American Community Survey Reports, by Brian McKenzie, issued May 2014. The Economist/ Siemens study can be accessed here. As the Washington Nationals begin a new season, we wanted to take a look at how much it costs a family to attend a baseball game in the nation’s capital. Each year, analysts at Team Marketing Report of Chicago, Illinois calculate the amount of money it costs a family of four to attend a baseball game. The total cost of attending a game is calculated by adding the price of four tickets, two beers, four soft drinks, four hot dogs, parking, and two adult-size hats. Team Marking Report found that in 2015 it will cost on average $211.68 per family to attend a Major League Baseball game. This is a 2.5 percent increase over 2014. So how do the Nationals compare to the rest of Major League Baseball? The primary reason that a Nationals game is so expensive is that regular ticket costs are the fifth highest in baseball. Hot dogs at Nationals Stadium are also expensive too – tying the Boston Red Sox and Oakland Athletics for sixth highest at $5.25 each. On the positive side, average parking for a Nationals game is one of the lowest at $10.00. If you are a fan that likes a bargain, we suggest attending a game in Phoenix, Arizona where the Diamondbacks take the award for having the lowest cost of attendance at $126.98. Ironically, the Diamondbacks also had the lowest winning percentage in baseball last year suggesting you pay for the product you get. You can explore the cost of attending a Nationals game and analyze other baseball teams using the interactive tables we created. Are Mom and Pop Shops Disappearing in D.C.? The recent spate of announced openings of new retail stores, including many high-end retailers at City Center and hip eye glass retailer Warby Parker, will no doubt help fill a void in the District’s retail landscape. These new stores will attract tourists on vacation shopping sprees and retain spending (and tax revenue) that might otherwise have occurred outside the District. At the same time, the proliferation of branded stores has changed the retail landscape in the District and in the nation. It is apparent to any casual observer that Mom and Pop stores are declining. 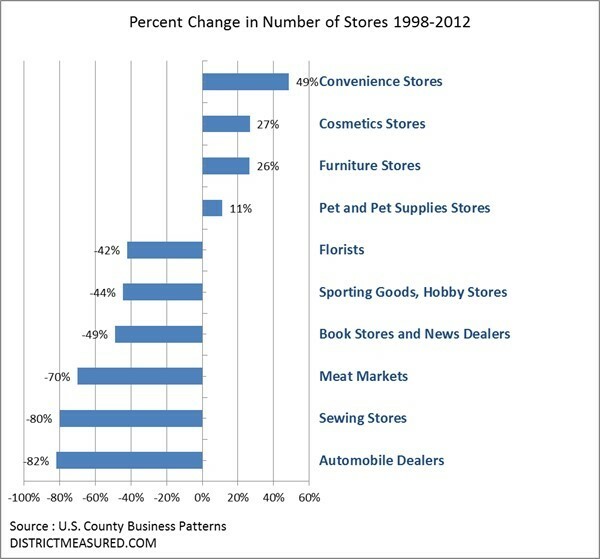 In this post we measure this changing retail landscape by looking at data on retail store size from the U.S. Census. There are seven categories, ranging from small Mom and Pop stores with 1 to 4 employees- to large big box retailers with more than 250 employees. Here’s what the data looks like. 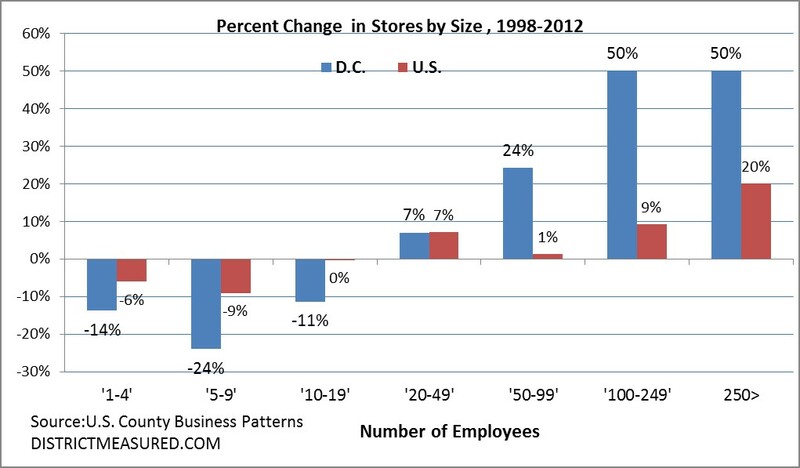 There has been a sharp decline in Mom and Pop and family run stores in D.C. The pace of decline has outpaced the nation. At the opposite end of the spectrum, there has been a 50 percent increase for both stores with 100 to 249 employees and for stores with 250 or more employees. This far outpaces the comparable figures for the nation at 9 and 20 percent, respectively. It is important to note that small stores with fewer than 20 employees still comprise the vast majority, more than 85 percent of all retail stores, but their numbers are declining. To some extent D.C. may also be catching up to the nation in terms of numbers of large big box retailers whose presence had been relatively scarce here. Here’s a sample of the type of stores that are disappearing in D.C. and the stores who are taking their place. Butchers (meat stores), Auto dealers and Book Stores are all disappearing. Pet, Furniture, Cosmetics and Convenience stores are increasing in D.C. This trend is bound to generate varying opinions among readers. As revenue forecasters we are asked to predict what the future will look like. My prediction is that there will soon be a saturation point and consumers will want a more varied retail landscape. The data is from the U.S. Census Bureau: County Business Patterns. Student loans play an increasingly important role in financing higher education. Student loan debt from federal and private loans almost tripled between 2004 and 2012 across the nation, and is now close to $1 trillion. Many District youth attend out-of-state schools, and despite federal tuition support for District students, increasing burdens of higher education is an important financial consideration for District families. We estimate that total stock of student loans in the District was approximately $5.1 billion at the end of 2012, up from $2.2 billion in 2004. Some of this increasing burden is imported; it belongs to those who moved to the District after school, in search for better jobs. Still, the total growth in borrowers outpace the population growth, suggesting that some of the increase is due to higher demand for higher education,and rapidly increasing costs, which push more people into borrowing. In 2012, 126,000 individuals, that is, one fifth of the resident population, reported student loan balances in the District. This figure was 73,000 in 2004, only 13 percent of the total population for that year. Indeed, data show that average student loan borrowing in the District is the highest in the nation. According to data collected by the Federal Reserve Bank of New York, average student debt among D.C. residents was $41,200, up from $30,000 in 2004. To compare, student debt among residents of New York City was $11,000 less, and debt reported for the entire nation was $16,000 less. Even residents of Manhattan carried less student debt in 2012, at $38,500. Who carries the biggest student loan burden? They are mid-carrier individuals, likely still paying for their own student debt. Those between the ages of 30 and 40, on average, report about $50,000 in student debt, and survey data suggest that this group accounts for 45 percent of all borrowing in the District. Borrowers from this age group carry the highest balances in the nation, too, but their individual borrowing are not as high in relative terms, so they account for 33 percent of total borrowing across the nation. Those below the age of 30 (bulk of the millenials) are not far behind, juggling about $37,000 of debt, accounting for the 35 percent of total borrowing in DC. District residents above the age of 50, on average, owe $31,100. These borrowers could be parents paying for their own children’s education; they could also be professionals who went to school at a later age to get a graduate degree–an important consideration in career advancement in the District’s competitive labor market. The average loan amount older residents carry is much higher than the national average of $24,800, but a as a group, 50+ year-olds do not borrow intensively: they only account for only 9 percent of the borrowing In the District, compared to 16 percent in the nation. Delinquency rate for student loans is increasing and this increase will likely continue given many loans were deferred in 2012, and were still under the grace period when data were collected. Delinquency rate in the District stood at 16 percent at the end of 2012, up from 11.8 percent the year before. The same year, national delinquency rate was at 17 percent, and in NYC, this rate was 16.5 percent. However, District residents have relatively small delinquency balances at about 7 percent of their total borrowing, compared to the national average of 11.7 percent and NYC average of 10.5 percent. Surprisingly, delinquencies among 50+ year-olds are very high at 22.4 percent—this is 6.4 percentage points above the average across all age groups in the District. Across the nation, this age group has the lowest delinquency rate. However, on loans that are bulk of the borrowing in the District—those carried by 30- to 40-year-olds—delinquency rates are much lower at 13.6 percent and these borrowers have been delinquent only on 7 percent of their total balances, compared to the 12 percent across the nation. Younger adult residents of the District do even better—under-age-30 delinquency rates are similar to the nation at 15 percent, but these borrowers are delinquent on 5 percent of their balances compared to 9 percent across the nation. What exactly is this data? Student borrowing and default data is a part of The FRBNY Consumer Credit Panel, a nationally representative 5% random sample of all individuals with a social security number and a credit report (usually aged 19 and over). Delinquency rates are calculated as the proportion of student loan borrowers with 90+ days past due accounts (including defaults).